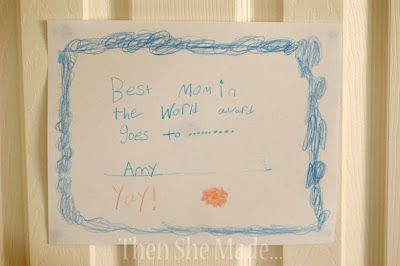 Then she made...: The sweetest thing ever! 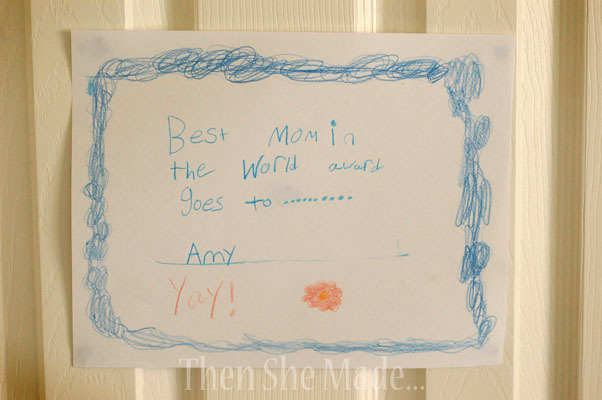 My little one had made me an award/certificate. I went to bed that night with a smile on my face. So, what does this have to do with my blog and the things I make? Everything, of course! Her little act of kindness really got me thinking. I like to make things, that's a fact. Another fact is that the majority of what I make, I usually give away. I always hope that my creations will brighten someone else's day. Unfortunately though, I get caught up more in the perfection of the project than in the message I'm hoping my creation will convey. I was thinking about the responses I get to my creations, "How did you make that? ", "I could never do that! ", "You must have so much free time! ", "Where did you get....?" Those are all great but when I realistically look at it, the focus has turned back to me instead of it being on them. All I wanted was to see their smile and maybe hear, "you made my day!". So, I'm very grateful to be the recipient of my daughter's little award. It reminded me that love, encouragement, and kindness doesn't need to be in the form of a cute craft, clever idea, or matching ribbons. I've been stressing about Valentine's ideas this year, looking at blog after blog for great ideas I can make and give. However, I just might skip the trinkets and crafts this year. Instead, I think I will write heartfelt notes on the back of a hand drawn certificate. That would be perfection in and of itself. Then the person getting the gift would know exactly how I feel about them. My message would be more clear. So, go make somebody an award - I promise you, it will make their day!!! It doesn't get better than that! How sweet!